MUNICH, Germany -- Secretary of State John Kerry told lawmakers during a private reception in Germany that he personally supports sending lethal aid to the Ukrainian military, even though President Barack Obama has yet to make a decision on whether to say yes to Ukraine’s arms request. Kerry is the latest top U.S. official to favor arming Ukraine’s armed forces directly, as they struggle against heavily armed Russian-backed separatists in Eastern Ukraine. Vice President Joe Biden this weekend came very close to endorsing military aid for Ukraine when he pledged to continue to support Ukraine’s “security” needs. The top U.S. general in Europe, Philip Breedlove, has for months been advocating internally for greater U.S. support for Ukraine. Defense secretary nominee Ashton Carter testified last week he was inclined toward sending arms to Kiev. Two U.S. lawmakers told me that Kerry, in separate conversations Saturday evening at the Munich Security Conference, had told them he was for the lethal aid. Kerry’s position matches that of the State Department writ large, led on this issue by the assistant secretary of state for Europe, Victoria Nuland. The White House, especially National Security Adviser Susan Rice, have been resisting, concerned that sending weapons will lead to Russian escalation. 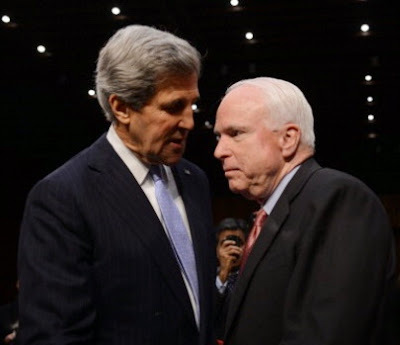 Senate Armed Services Committee Chairman John McCain declined to comment on his private conversations with Kerry, but told me that many inside the Obama administration have told Congress they support the weapons plan. “When you sit down with many members of this administration, it’s like wink-wink nod-nod, we agree with you guys, we’re trying,” said McCain. For many lawmakers, the situation is similar to the internal debate in 2012 over arming the Syrian rebels, a plan supported by Secretary of State Hillary Clinton, Defense Secretary Leon Panetta and CIA Director David Petraeus. It was ultimately vetoed by senior White House staffers and Obama. “It always reaches the Susan Rice, Valerie Jarrett level and then it dies,” said McCain, referring second to the president's senior adviser. In a statement to me, State Department spokeswoman Jen Psaki didn’t deny that Kerry has been advocating internally for providing arms to Ukraine. But she emphasized that he supports the negotiations among the U.S., European nations, the Ukrainian government and Russia. “Secretary Kerry told everyone throughout the weekend publicly and privately that any decision should be made in close consultation with key partners and allies, and that the only kind of lethal assistance under consideration is defensive,” she said. “The bottom line is there is no military solution and right now our focus remains on supporting the diplomatic process, while also maintaining to ability to have discussions internally about the right kind of assistance to provide to Ukraine." Kerry has been engaged in fervent diplomacy with Russian Foreign Minister Sergei Lavrov for months to find a compromise. But after Lavrov made comments about Ukraine that led the audience in Munich to laugh and boo, Kerry told him he had not helped matters, according to McCain. Vice President Joe Biden is also said to support giving lethal aid. One U.S. official said that the original version of Biden’s speech included more lines of support for arming Ukraine, but they were edited out by the National Security Council staff. “If he doesn’t believe they are seriously considering it, that speech was way out on the edge,” Senate Foreign Relations Committee Chairman Bob Corker told me. Corker added that lethal aid was just one part of what's needed to stave off Ukraine’s collapse, and that increasing economic aid was just as crucial. During his press conference today in Washington with German Chancellor Angela Merkel, Obama seemed to rule out sending arms to Ukraine right now, saying that he would wait until the diplomatic process plays out. Merkel and French President Francois Hollande, who publicly oppose arming Ukraine, are in the middle of a series of frantic meetings with the Ukrainian government and Russian President Vladimir Putin. “It is true that if in fact diplomacy fails, what I’ve asked my team to do is look at all options … The possibility of lethal weapons is one of those options that is being examined,” Obama said, emphasizing that the point of arming the Ukrainians would be to raise the costs of aggression for Russia, not to give Ukraine the ability to defeat the Russian army. Merkel got into a public rift with members of Congress at the Munich conference when she warned that arming the Ukrainian military would only make the situation worse. Republican Senator Lindsey Graham told me that even if she believes this, announcing it was damaging. “Why would she say what she did so publicly?" Graham asked. Senator Sheldon Whitehouse, the Rhode Island Democrat who led the Munich Congressional delegation with McCain, told me he supported giving the president the authority to arm the Ukrainian military but that issue must not create a rift in the alliance with Europe. “The Germans gave us very solid assurances that whatever our disagreements may be on lethal aid," he said, "that is not going to form a basis for a rupture in working together in all the other fronts." Obama can’t have it both ways; he can either side with Germany and decide the risks of arming Ukraine are too great, or he can side with the majority of his national security team and Congress by moving forward with military aid if and when the current round of talks with Putin fails. Not making a decision is a decision of its own. And the more the president delays, the more leverage Putin and the Ukrainian separatists will have to negotiate with, as they continue to press their military advantage on the ground.